Tuberculosis (TB) of the backbone is not common, but is still seen in poor communities, especially in children. It is the most common form of tuberculosis of the bone. It is important to recognize and treat it early, before damage to the backbone causes nerve damage and paralysis. If a child begins to develop a sharp bend in the middle section of the backbone, with shortening and thickening of the chest, it is probably tuberculosis of the spine. You can almost be sure it is, if someone in the family has TB of the lungs. 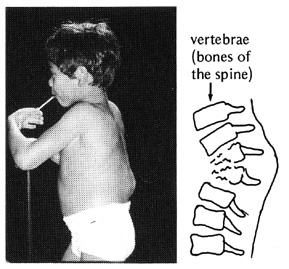 As the spine collapses forward, the child may have to hold himself up using his arms. Seek medical help quickly. Skin test, X-rays (of the chest and spine), and microscope examination of pus from abscesses (pockets of pus) may help in the diagnosis. If the X-ray shows typical bone destruction, the child should be treated for tuberculosis even if no TB germs are found. It begins little by little-often without pain at first. A bump develops in the backbone. This is because the front part of one or more vertebrae is destroyed and collapses. The child has trouble bending over to pick things up. An abscess full of pus may form near the lump in the spine. It may open lower on the body and drain pus. As the condition gets worse, back pain may begin. Often someone in the home has TB. Only half of children with TB of the spine also have TB of the lungs. A back brace may help keep the damaged spine straighter. It can be made of plaster, or of plastic using techniques similar to those used for making plastic leg braces (see Page 558). 1. Cut an oval piece from a heavy tin. 2. Hammer the tin to fit the child's back. Without forcing, try to put the back in the straightest position possible. 3. Pad the tin and wrap it with a soft cloth. 4. With an elastic bandage, bind the plate firmly to the child's back. CAUTION: Make sure the bandage does not hurt the child, damage his skin, or make it difficult for him to breathe. The child in the photo on the previous page was effectively braced by a traditional bonesetter in this way. In severe or advanced cases, surgery may be needed to help straighten and stabilize the bones of the spine. CAUTION: Because of the risk of paralysis, an orthopedic surgeon should be consulted if possible. With early, complete treatment the damaged bones will usually heal and the child may live normally, although often somewhat hunched over. If nerve damage and paralysis have begun, sometimes surgery (or even bracing during treatment) can bring some improvement. When nerve damage is severe, rehabilitation will be the same as for spinal cord injury (see Chapters 23, 24, and 25). PREVENTION consists of early diagnosis and treatment of tuberculosis, and in the fight against poverty. Vaccination against TB may also help.